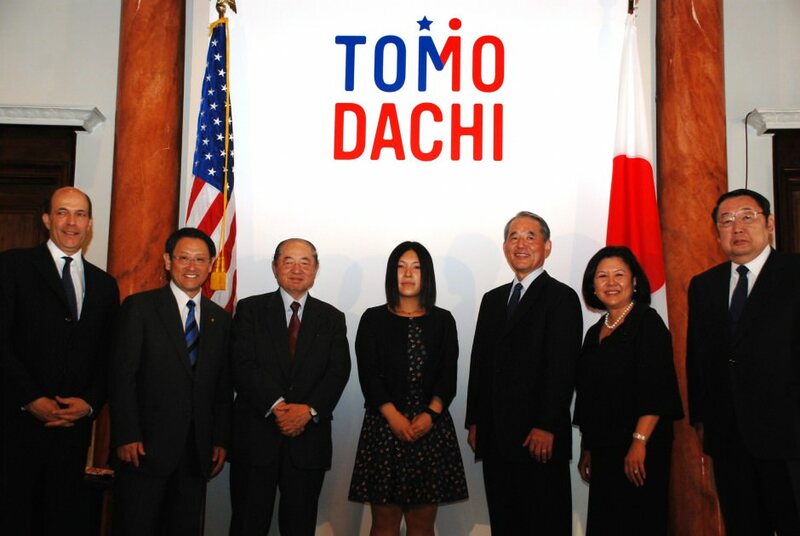 April 18, 2012 – Five leading Japanese companies today become the newest partners in the TOMODACHI Initiative, the bilateral public- private partnership launched in 2011 by the U.S. Embassy in Tokyo and the U.S.-Japan Council. Toyota Motor Corporation, Mitsubishi Corporation, Hitachi, Ltd., Mitsubishi UFJ Financial Group, Inc., and Takeda Pharmaceutical Company Limited are the latest companies to contribute to TOMODACHI, which seeks to support Japan’s recovery from the Great East Japan Earthquake and invest in the next generation of leaders on both sides of the Pacific to strengthen the cultural and economic ties between the United States and Japan. The contributions from these five top Japanese firms – amounting to over $4 million – will be used to create a new “TOMODACHI Fund for Exchanges,” as well as to strengthen TOMODACHI’s administrative capabilities. Under the new Fund, hundreds of young Japanese students will be given enhanced opportunities to participate in high-quality educational and cultural exchange programs with their American counterparts – helping to achieve TOMODACHI’s vision of giving hope to the young people of the Tohoku region and Japan as a whole, as well as providing the skills and opportunities they need to pursue their dreams. These corporate commitments are important because they will sustain these opportunities for years into the future. Senior executives from the five companies – including Toyota Motor Corporation President Akio Toyoda, Mitsubishi Corporation Chairman Yorihiko Kojima, Mitsubishi UFJ Financial Group, Inc. Chairman Takamune Okihara, and Takeda Pharmaceutical Company Limited President and CEO Yasuchika Hasegawa – joined U.S. Ambassador John V. Roos and U.S.-Japan Council President Irene Hirano Inouye at the U.S. Ambassador’s Residence in Tokyo for a special event to announce the new commitments. Among the attendees were representatives from Tohoku relief organizations, as well as a young Japanese woman who will soon participate in a TOMODACHI-supported educational exchange program in the United States. TOMODACHI is a public-private partnership, led by the United States Government and the U.S.-Japan Council and supported by the Japanese Government, that supports Japan’s recovery from the Great East Japan Earthquake and invests in the next generation of Japanese and Americans in ways that strengthen cultural and economic ties and deepen the friendship between the United States and Japan over the long-term.